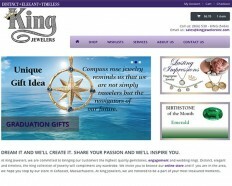 Owl Watch in collaboration with A-Type Marketing redesigned and developed a new eCommerce site for King Jewelers. The site is fully responsive and is fully functional on mobile devices. The framework includes Wordpress, Woocommerce and uses authorize.net for the payment gateway.